It had been United States policy to support autocratic regimes throughout the Cold War years provided that the foreign government was anti- communist. Iraq did not quite fit that mold, but sometimes geopolitical imperatives dictated decisions that did not fit the norm. 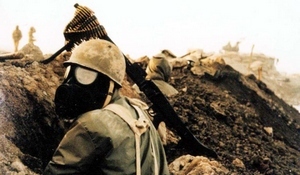 In 1980, Iraq attacked neighboring Iran and looked to the United States for material aid. President Reagan had restored relations with Iraq during their war with Iran. He furnished aid to Iraq and even intelligence assessments. That relationship would sour when it was disclosed that America was secretly furnishing weapons to Iran in the Iran -Contra affair(1986). Although Iran's Islamic ideology rejected Marxist-Lenin beliefs, they were already an enemy of the United States having held American Embassy diplomats prisoners for well over a year during the Carter presidency. 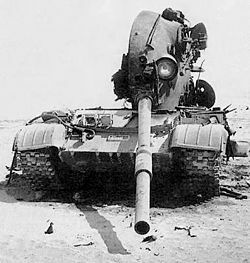 The Soviet Union made no overt effort to supply military aid to Iran, but their satellite countries filled the breech. With a wink and a nod, some Iranian relationship with the Soviet Union was thus cemented. President Bush resisted imposing sanctions on Iraq for human rights violations. Nor did his administration spot illegal loans funneled to Iraq through an Italian bank doing business in the United States. In addition, there was the debt Iraq had run up during the Iran war borrowing from other Arab nations. By 1990, Iraq actions was a game changer that could no longer be rationalized by President Bush. In 1990, their was a glut of oil on the world market that seriously impacted price. Hussein felt the pinch and accused the United Arab Emirates and Kuwait of exceeding agreed upon oil quotas (July 17). President Bush responded by suggesting a conciliation process and warning that force was contrary to the United Nations Charter. The advice fell on deaf ears. With a declining economy, Hussein looked for a life line. Tiny Kuwait, smaller than New Jersey, shared a common border with Iraq on the Persian Gulf. That border was astride their common Rumaila oil fields. Hussein claimed, possibly with some justification, that Kuwait was draining oil through slant drilling into the Iraqi side and threatened force to establish Iraqi territorial rights. Iraq oil pumped by Kuwait meant lost revenue. Three visible Iraq divisions sat on the border. 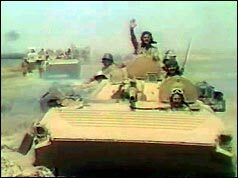 The United Nations Security council acted on the same day as the invasion with a resolution condemning the invasion and granted Iraq four days to leave Kuwait. On August 6, second Resolution 661 imposed trade barriers barring Iraq oil and financial sanctions. Cuba and Yemen abstained. Significantly, there were no veto votes by the Russians (former Iraq ally) or the Chinese. The Soviet Union was totally engaged in its own disintegration. Neither the soviets or Chinese contributed armed forces or monetary aid to the force assembled by the United States. 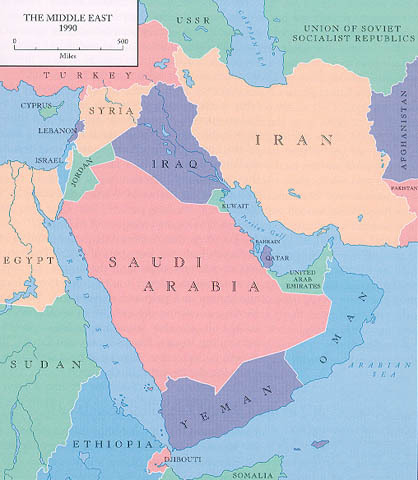 President Bush was concerned that Hussein might have plans to continue south and cross into Saudi Arabia. Conquest of that country would place 40% of the world's oil in Iraqi control. Bush dispatched Secretary of Defense, Richard Cheney, to consult with the Saudis (King Fahd) and gain their permission to stage American troops on Saudi soil. With the approval in hand, 150,000 Americans were readied to embark under the field command of General H. Norman Schwarzkopf, a Vietnam veteran and an extremely well designed and coordinated plan by General Powell, Chairman of the Joint Chiefs of Staff. 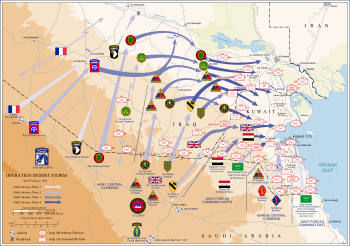 This first phase was known as "Operation Desert Shield". Hussein conditioned his withdrawal with an Israeli withdrawal from the West Bank and Gaza and establishment of a Palestine state. Bush rejected the link out of hand. 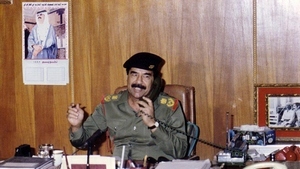 On November 29, the Security council passed Resolution 678 demanding that Hussein leave Kuwait by January 15, 1991, or all "necessary means" would be used to enforce the Resolution. 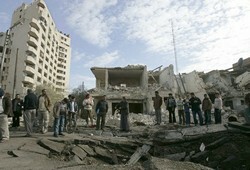 China, Cuba and Yemen abstained. Bush ran into a problem in Washington. Congress insisted that they be made a party to the decision to go to war, and insisted that the Constitution granted them the sole right to declare war. The president demurred. After a two day debate, the congress, by a small margin, granted Bush the right to "use force". Short of a declaration of war, and a reminder of Truman sidestepping congress with a United Nations "police action" in Korea (1950). The Constitutional requirement that only the congress could declare war was eliminated. This was a giant step in rationalizing that war was not a war if it was a police action. President Bush employed a similar rationale. On February 22, Bush delivered another ultimatum. Hussein was given 24 hours to withdraw from Kuwait. 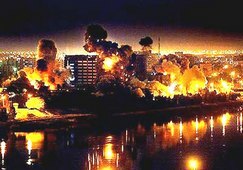 Saddam Hussein must have realized he could not withstand an attack of United States forces and began a scorched earth policy in Kuwait and put the oil fields to the torch. 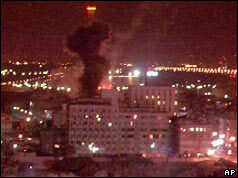 On February 24, Saudi forces commenced an attack on Kuwait City. Two U.S. Marine divisions hit the oil fields. The tank battle at 73 Easting was a slice of a two day battle February 26-27. The coalition had a resounding victory knocking out 85 tanks with a loss of one Bradley and one killed. The after action report - 600 Iraqi dead. The following is a small slice of an eye witness account of one of the many tank battles at 73 Easting on February 26 as related by Captain H.R. McMaster, Eagle Troop. 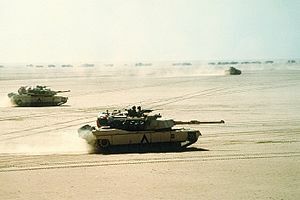 Second Squadron, Second Armored Cavalry Regiment . vehicles and they were easily discernible to the naked eye. us as we came over the rise. We, however, had surprised them. of the sandstorm, they had neither seen nor heard us. finder and the display under the gun sight showed 1420 meters. breach recoiled and the HEAT round flew toward the enemy tank. a SABOT round, slammed it in the breach, and screamed, "up." tank. I was talking on the radio as Koch let the round go. ignited the fuel and ammunition compartments". On February 27, a similar battle raged at an area called Medina Ridge between the 1st Armored Division along with the U.S. 3rd Infantry Division matched against the crack Medina Division. The battle was fought over a two hour period and considered the largest tank battle in U.S. history. The enemy was entrenched behind a ridge that presented the strongest defensive position of the war. Iraqi resistance was intense. Apache helicopters and fixed wing planes aided the ground forces that destroyed 186 enemy tanks. 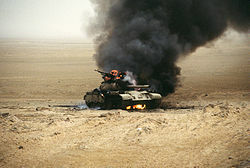 The Coalition suffered 4 damaged tanks and one soldier was killed. in four days the war was over. 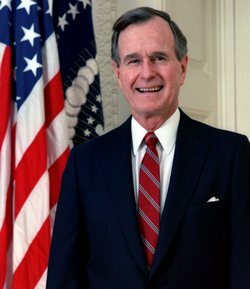 President bush was able to state that Kuwait was free and Iraq had surrendered.On February 28 Iraq accepted a cease fire with conditions. 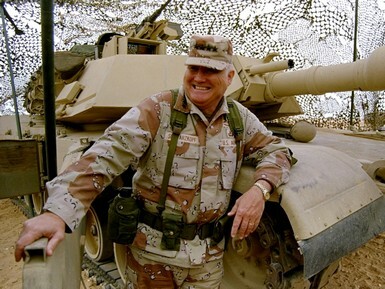 General Schwarzkoph desired to press on to Baghdad, but the President was firm in halting the war explaining that objective had been to liberate Kuwait. Bush believed the victory had reinforced his belief in a "new world order". Terrorist attacks in the United States emanating from Afghanistan and the president's son, the 43rd president, George W. Bush, challenged that vision. A protective no-fly zone barred Iraqi military craft to fly north of the 38 th parallel (Kurdish territory), and south of the 32nd parallel (Shia territory) in effort to protect minority populations. American policy was particularly concerned to furnish protection for those with religious differences other than that of the ruling Baathist Party. 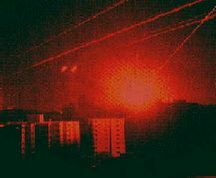 In the final week of the President Bush term, he ordered American planes to strike Iraqi installations because of no-fly zone violations.The incoming President William (Bill) Clinton (1993-2001) would repeat air attacks on Iraqi infrastructure to address similar Saddam Hussein violations. The era of three centuries of American wars ended and so did the Bush vision of a peaceful "new world order". The 21st Century would produce new enemies for Americans. Its citizen soldiers will again be called to defend the nation's noble ideals, and as in past centuries, equal to the task. In 1630, John Winthrop viewed the rocky coast of Massachusetts and saw the future: "We will be as a city upon a hill. The eyes of all people are upon us...". American Decades 1990-1999. Bruccoli, Mathew J. and Layman, Richard, Editors, Gale Group, Farmington Hills, MI. 1994. Graff, Henry F. The President-Third Edition, Gale Group, Farmington Hills, MI 1997. Kane, Joseph Nathan, Podell, Janet. Facts About the Presidents, H.W. Wilson Company, New York 2009. Melville, Andrew. Russian Foreign Policy in Transition, Central European University Press, Budapest 2005. Iraqi-Russian Relations, 1992. Yetiv, Steve A. The Persian Gulf Crisis. Greenwood press. Westport, CT 1997.